Sr. M. Cecilia Dieu, Sr. Mary Marta, and Sr. M. Carla Elisa have come to see and have stayed… they want to follow, love and serve the Divine Master. They come from different countries and different backgrounds, but are united in one purpose: to live and to communicate Jesus to the world as the WAY, the TRUTH and the LIFE. We, Sister Disciples of the Divine Master have been blessed with four young ladies who have recently joined our community as Candidates. Like Mary, they also believe that the one thing necessary is to listen to Jesus and to respond generously and totally to his call. “Even before moving to the USA I felt called to the religious life”, says Sr. M. Cecilia Dieu- originally from Viet-Nam. However, adverse political circumstances in her home country prevented Sr. Cecilia Dieu from pursuing her religious call. 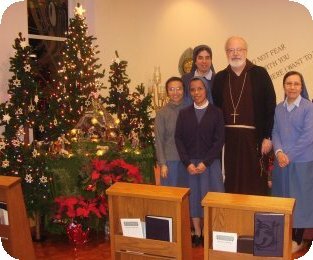 Once in California, Sr. Cecilia Dieu visited the chapel and the convent of the Sister Disciples in San Jose, and kept coming back for Eucharistic Adoration every weekend. “My desire to join the Sisters became stronger after visiting the Staten Island Community in 1998”. After that trip, she did not want to wait any longer and she applied for and entered the pre-Candidacy program with the Sister Disciples. “I love this congregation and its mission for the Church”, Sr. Cecilia Dieu says with a smile on her face, “the daily Eucharistic Adoration, the Liturgy, the community life, the apostolate… all fills me with such an awesome presence of Jesus that I just want to fully respond to God by consecrating my life to his service within the congregation of the Sister Disciples of the Divine Master”. Sr. M. Carla Elisa: "Hi, my name is Miriam Martinez. And my religious name is Sr. M. Carla Elisa. I am originally from Mexico. I have lived in the States already for seven years. Since I was very young I have felt in a very special way a call from God to become a religious sister. Then after having made a long period of discernment I decided to join the Congregation of the Sister Disciples of the Divine Master. I am in my first year of junior now since April 6th, 2006. I fell very happy to be consecrated to Jesus Master, Way, Truth and Life. I love my vocation very much. It is a very special blessing to me to belong to our beautiful and holy Congregation into the Pauline Family." 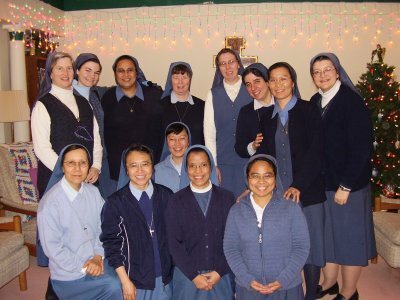 With membership into the Candidacy program increasing, the Sister Disciples thank the Lord for the beautiful gift of vocations, and they invite anyone hearing the tender voice of Jesus, to freely “Come and see”; it may be the best decision you ever made in your life. Each of us is a miracle and each of us is a gift from God. Life will guide you in the process of discovering the unique, personal plan God has for your life. As we come into this world, God has already prepared all the graces, gifts and talents for each one of us. He is just waiting for us to go to Him and ask for them. It is for this, that I am inviting you to spend an hour of prayer before the Blessed Sacrament, to ask for these gifts, to be guided and enlightened in our discernment for our vocation. The process of responding to God’s call to follow Him requires a foundation or an anchor in order to grow in our relationship with Him, He alone can open our mind to know His holy Will. Someone being called in general to the vocation of the married life may not be called immediately to marry a specific person. Eventually however, because of his prayers, God’s guidance will lead to the proper choice of a partner. If the Lord is calling a person to His service either to the priesthood or religious life, God manifests this call in a very sensitive way, because God has already called and let this person feel an attraction to commit himself or herself to Him. God is the first one to love us and make us feel it. Only many times because of worldly attractions we turn a deaf ear. Therefore there is a need to pray, and in prayer and in silence, one may come to discern God’s Will and eventually come to surrender oneself. If you are interested in receiving light and guidance to know more, please come for an hour a week, Jesus in the Blessed Sacrament is waiting to give light to each person in order to discern God’s Will. for further information. We accept young women between the ages of 18-30 who would like to have a vocational discernment.